Can trees help my toothache? 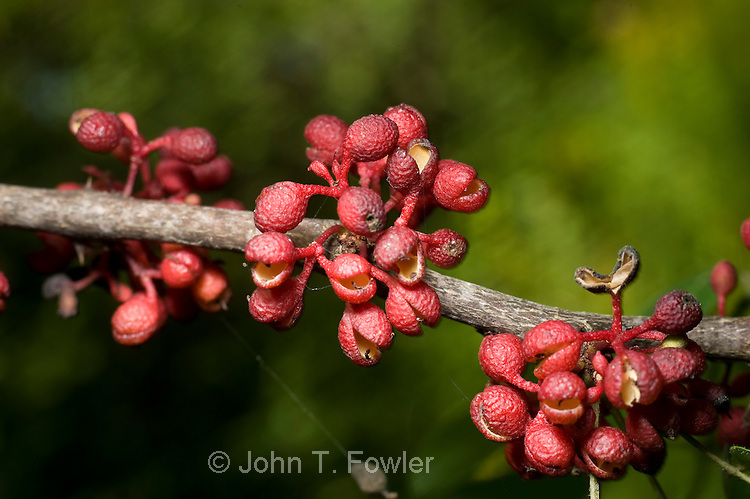 Sure, there is a tree nicknamed the toothache tree…Zanthoxylum americanum. The tree is 10-20 feet tall and some consider it a tall shrub because of its multiple trunks. It is also called prickly ash for its leaves, which are similar to ash tree. The bark is quite spiney too. But, it is closely related to orange, lemon and grapefruit trees rather than the ash tree. The tree is native to eastern North America. Native Americans used to bite into the berry or chew on the bark. This would release a volatile oil,which contained an alkaloid believed to be berberine. The oil and the alkaloid creates a numbing sensation in the mouth which would ease the pain from a toothache. Later in the 19th century herbal doctors would continue to use it. It actually does numb the mouth if you dare. Nature can be fascinating!! They say 90% of all people don”t floss their their teeth on a regular basis. And according to studies,most people know that they should! The fact is when we brush our teeth every day,there is still plaque between our teeth that the toothbrush can not clean. Some people honestly do not have the manual dexterity to manuver the floss between their teeth….so I suggest to you that something is better than nothing. I recommend to you that a toothpick,a proxy brush(kind of a fancy pipe cleaner) or a flossing aide with a handle can be just as good. Stay tuned next week for my next post and I will tell you the number one aide that will save your gums and teeth and keep me out of business. The modern day toothbrush,nylon bristles and plastic handle, was invented in 1938. The average person brushes for 13 seconds..check it out don’t say anything but watch your spouse,friend or sibling…see if I am right! Deep thought… Flossing adds years to your life.